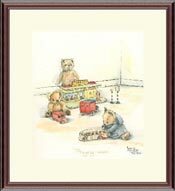 The time has come to tell you of Edward Bear & his friends. Unfortunately Edward is not a good little bear. No! 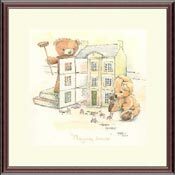 Just the opposite, Edward is a very, very naughty bear from the moment he was born he was trouble. Trouble with a capital " T ". Trouble for his mother and father and trouble for everyone around him. One morning Ann Stutt noticed that Edward had his hand deep into a sweet jar which was placed on the very top shelf of the old pine kitchen dresser. He was calling to his friends "come on every body I have found the sweets". She decided to paint Edward there and then so that all the children can see the mischief he gets into and also the fun and games. Ann Stutt was born in Salisbury and whilst at school showed great interest in drawing and painting which eventually led her to train at Salisbury School of Art. 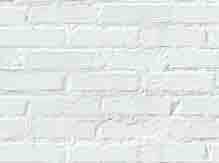 Ann now lives in a small hamlet in Surrey with her family and attends the Hackney Arts Centre. 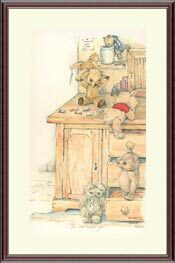 The teddy series Edward and Friends came about by chance, inspired by her son Jeremys toys, and charmingly depicts the antics of these bears in a delicate combination of pen and wash medium. A series of signed limited edition prints, taken from the original watercolour paintings, have now been published for posterity.